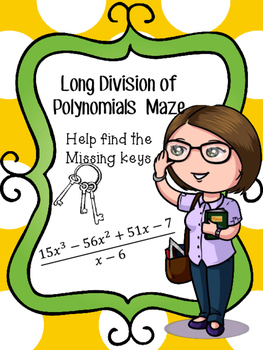 This is a maze that students solve dividing polynomial maze to solve. • Click the green star next to my picture to become my newest follower. • Go under “My TPT”, and Click on “My Purchases”. Then, click the provide feedback button next to your purchase. Every time you leave feedback on a purchase, TPT gives you credits that you can use to save money on future purchases. I value your feedback as it helps me determine what types of new products I should create for you and other buyers. © EducatorJenn, 2012. All rights reserved. Purchase of this product grants the purchaser the right to reproduce pages for classroom use only. If you are not the original purchaser, please download the item from my store before making copies. Copying, editing, selling, redistributing, or posting any part of this product on the internet is strictly forbidden. Violations are subject to the penalties of the Digital Millennium Copyright Act.